Kinsta’s New Multi-User Access Feature & I Love It! The team at Kinsta has bounced back with a long-awaited yet a much-needed feature. 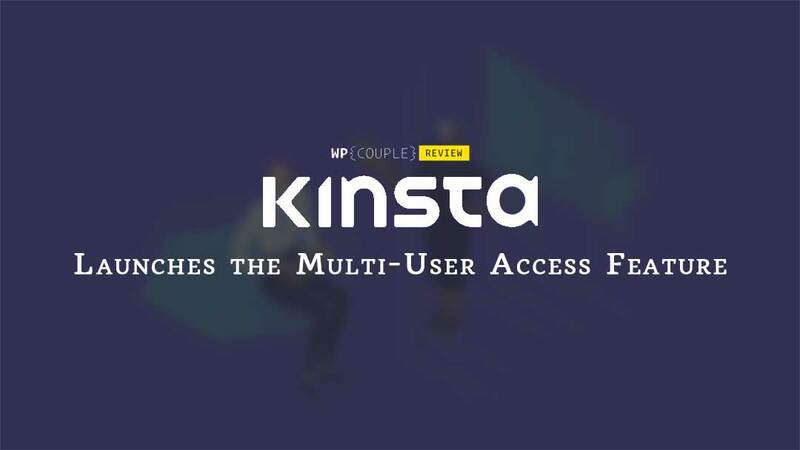 Kinsta now allows you to manage a multi-user access in your hosting account. If you run a business or manage large projects then I’m sure you are very well aware of the importance of working in a multi-user environment. If you have been following this blog and our work for quite some time, then I’m sure that one thing which must have remained satisfactory is the overall site performance. Rarely, we’ve encountered issues which generally comes with web hosting. The only reason being that we host many of our sites (more than 10) including WPCouple on Kinsta and things could not have been better – blazing fast performance, cutting-edge tech, and top-notch support. It has been so far an impressive managed WordPress hosting solution. We are a huge fan of their services and have even written an extensive review of its features and working. What made us fall in love with Kinsta, even more, is its incredible dashboard to manage WordPress which is indeed one of its best features. It is not only clean and well-thought but has almost every feature which a user wants in its web host. We like it so much that we were forced to write an exclusive piece featuring all the information it delivers. So, before you read any further do check out this article. One strong reason which makes Kinsta a high-end premium hosting service in the WordPress ecosystem is its incredible team. They are always working round the clock adapting with latest trends, paying great heed to customer feedback and then taking every possible step to make it happen. So once again, the team has bounced back with a long-awaited yet a much-needed feature. Kinsta now allows you to manage a multi-user access in your hosting account. Now you’ll be able to allow access to additional users in your MyKinsta dashboard. This can be made possible by using the section for Users. This allows you and your clients to manage assets more easily. 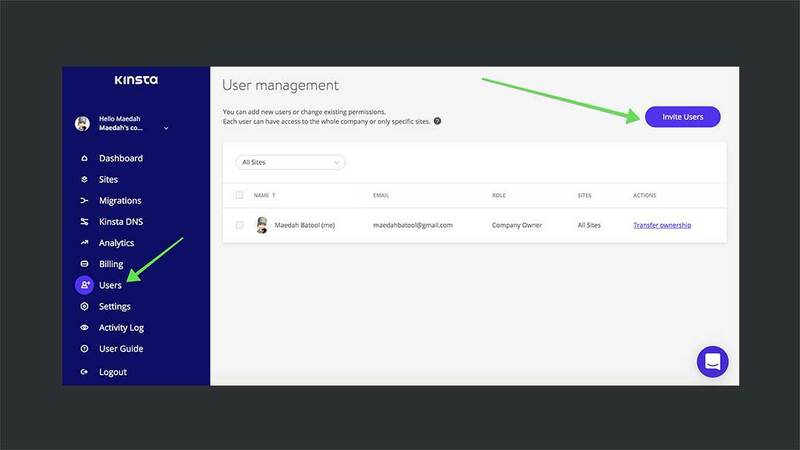 While hosting your sites with Kinsta, they allow you to create Company and Site level users in the MyKinsta dashboard.  Company Level: Such users can access company-level information. At present, they can enjoy three sets of access. Company administrators can access everything, including all sites. Company developers can manage all websites but do not have permissions to view details about company billing or settings. Billing users can only view the company’s settings and billing information.  Site Level: Users with this type of access can visit individual sites only. They can be site administrators who can access permissions to all site environments (including both live and staging) or site developers who can access only the staging environments. Go to Users in your MyKinsta dashboard and click it. This is the area where user management is handled. Towards the top right corner, you find a button called Invite Users. 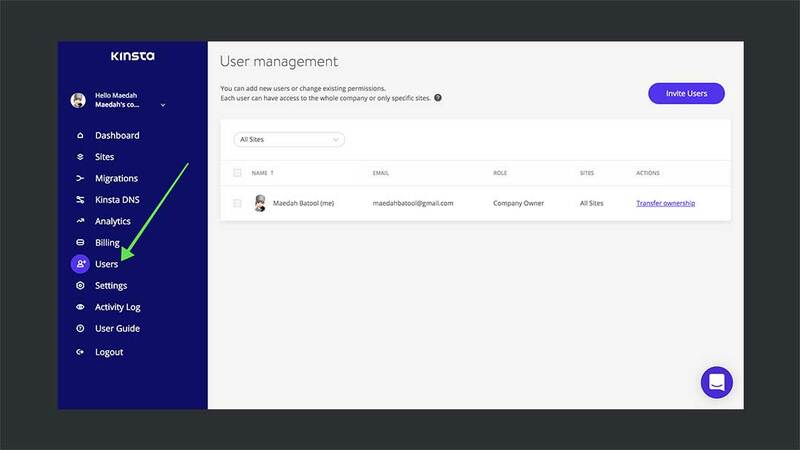 From here, you can add new users or change existing permissions. Each user can have access to the whole company or only specific sites. When you click it a new dialogue box will pop-up the screen. It asks you to enter the email address for the user whom you want to grant access. Fill this field. Next, to the email field, you’ll find a drop-down menu which asks to choose the type of access i.e. you want Company Level or Site Level access. The permissions for each of these user roles have been mentioned above. As a demo, I am uploading a GIF which shows how a Company Level access is granted to a new or existing user. You can do the same for anyone who needs a Site Level access. Once you are done, the user will receive an email with a link which will help him set up an account. If you run a business or manage large projects, then I’m sure you are very well aware of the importance of working in a multi-user environment. Moreover, giving everyone in your team the access they require can ease their job and in turn improve productivity. But this only comes with great trust and belief, and the MyKinsta dashboard helps you achieve every bit of it. We’ve build this feature from the scratch based on the interviews conducted by our UX team. We solved the most common cases that came up and we think we’ve made something that every user will enjoy. We’ll continue to listen to feedback and improve this corner of MyKinsta, just like we have improved other systems. Yes! And we firmly believe they Kinsta has been very particular about catering the needs of its users irrespective of which background they belong. Right now this multi-user access feature is enabled on all of their plans and you can start benefitting from it right away. So, what are you waiting for? Log into your MyKinsta dashboard or grab one of their plans to get started. Also, do share with us your experience and feedback regarding this out-of-box feature.